A stunning day with clear blue skies at high altitudes many times bely the temperatures which at 08:30 were hovering around 3-5 degrees Celsius. The trail north from Parinacota passed frozen streams, wetlands and lakes winding its way in the direction of Mt Guane Guane that dominated the northern horizon here. Shouts of a distant herdsman could be heard at times between the bustling and chattering of the waterbirds jostling for space in the unfrozen parts of the lakes. 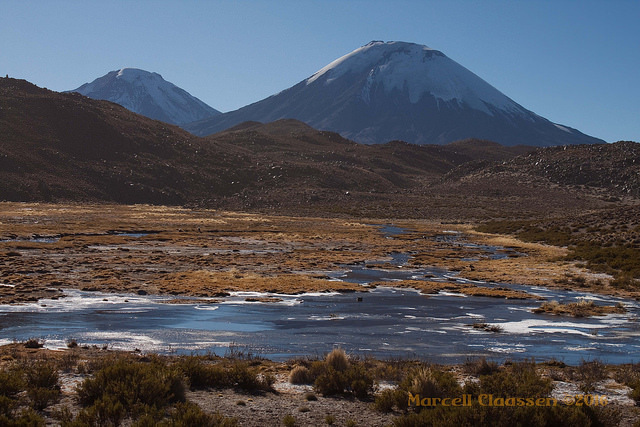 Partially frozen lakes with the twin volcanos of Pomerape and Parinacota in the background. I started heading back along the same trail thinking I’d find a trail heading toward the Cotacotani Lakes. Along the way, I met up with the herdsman following his alpacas. After the normal greetings, we chatted about the different trails and I then asked about the ‘nearest’ trail to get to the lakes. He directed me to a road I’d crossed earlier from where I should up up past a farmhouse and then over the hills from there - not far he said. 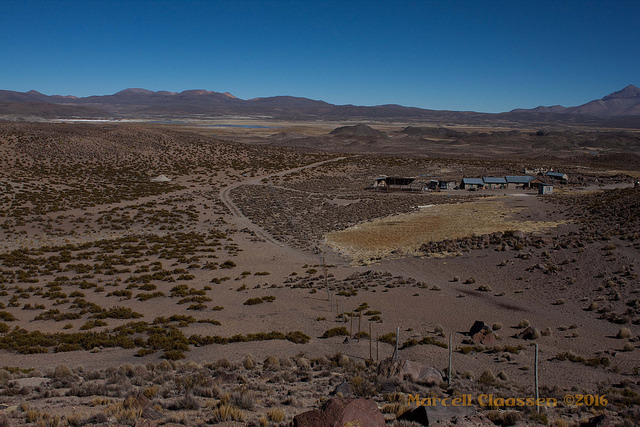 He reminded me that it was important though that I check whether anybody was home at the farmhouse and get permission to cross their land - being a biosphere reserve, there was still a lot of private land in the Lauca National Park. All the greetings again, and I headed off - it was only 09:45, so still early and loads of time to explore. So on rough calculations I would cross the trail soon…”soon” turned out to be a very relative term as the peak of each rocky hill just revealed more rows and rows of rocky hills. Admittedly the views were spectacular all the time, even when they only sometimes consisted of rocky hills and the twin volcanos. There were varying amounts of Llareta growing on the different hills and appeared to be more dense on certain slopes contrary to other slopes and hills where there were virtually none. Growing only near the ground where the air temperature is 1-2ºC warmer than the mean air temperature would explain why it’s more prolific in certain spots than others. 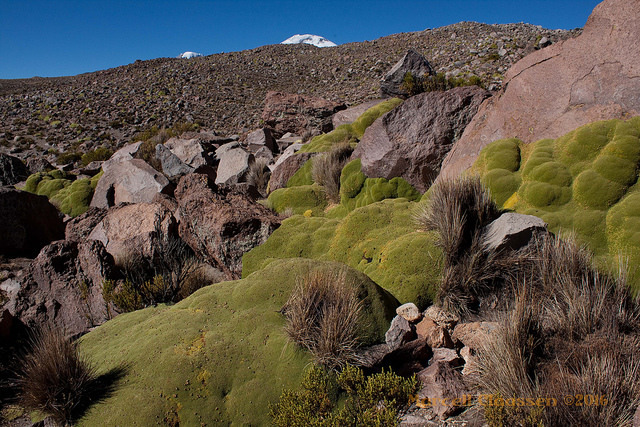 The Llareta is a strange plant but wonderfully adapted to these high and dry altitudes with the extreme cold during winter. The general appearance is that of a rock covered by moss (and is rock hard!) but actually consists of thousands of individual plants packed tightly together with tiny wax-covered leaves to prevent loss of moisture by evaporation. To appreciate how old some of these plants are, they only grow about 1.5cm (15mm) annually! Eventually after countless rocky hills, I was on the northern-most trail again to the Cotacotani Lakes and then a dirt road that goes along the western edge. I was left speechless at the views even though there were some dry lakes but where there was water, there was always a stack of birdlife around. Birds included the common Andean Coots, Giant Coots, Chilean Flamingos, Puna Ibis, grebes and swallows to mention but a few. The route I trekked to the Cotacotani Lakes (approx. 12km) Min altitude 4,400m - Max altitude 4,600m. Mark along the main road shows where there's an excellent viewpoint of the lakes. The road passed another trail that headed back to Parinacota near where I stopped to rest, take some photos and just relax in the spectacular surroundings. A perfect example of how stunning a desert can be! As the norm is here at this time of year apparently, the wind picks up between 11am and midday and adds a decent wind-chill factor even out in the sun. 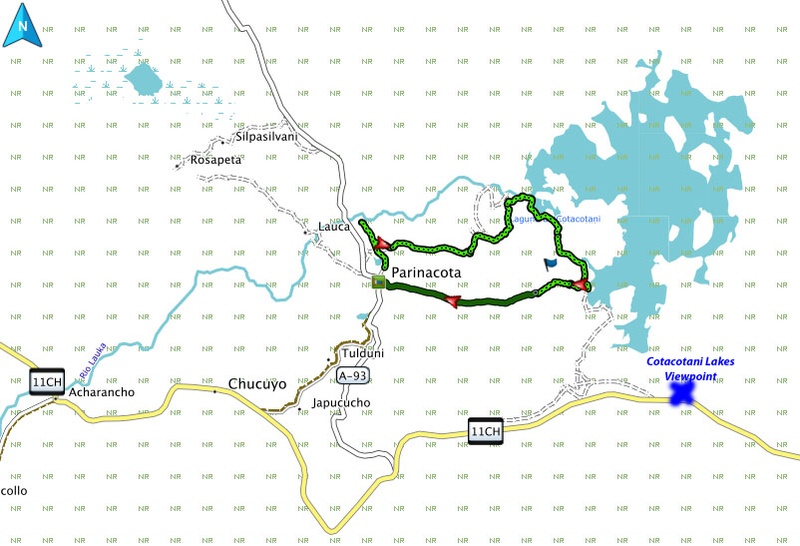 So just after 1pm, I started to head back to Parinacota village along the other direct trail. At a very relaxing pace this sandy trail was about 1 hour and added even more panoramas to my growing memory bank of amazing scenery here. I didn’t want to leave this place…the tranquility and beauty was leaving me mentally super refreshed! …and physically a little bit tired but still wanting more! I was mentally a prisoner of this desert where at least my mind would always return to for some respite.